My whole life I've heard the same thing, "Let Larrivee do it, he's not afraid of anything!" From the rickety cinder-block and plywood ramps we used to collapse with our BMX bikes, to a quarter century on a skateboard, stock cars, snowmobiles and of course motorcycle racing, it's been the assumption lots have made. But they would be wrong. There's been fear the whole time. Along with plenty of broken bones, injuries, surgeries. I am neither proud, nor ashamed of, my scars. They live with me. And I live with them. My face does not light up to tell their tales. They serve as a reminder of how truly lucky I have been and my friends who haven't. The maimed, the mutilated, the broken. And the dead. I'm sure they had fear as well. The main difference, I believe, between those who grid up, who take any sort of a risk outside of the norm and the rest, is that they refuse to be ruled by this fear. Some call it courage, others call it stupidity. Either way, it marks the distinct schism between the few who will, and the many who will not. But those who make decisions based out of fear...are already dead. 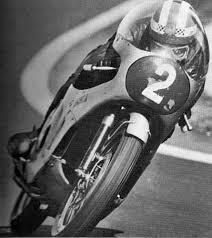 Mike Hailwood. MBE, GM, 14 TT wins, rescued a fellow racer from a burning car.